Here's my all-star, easy-to-follow recipe that yields the best chicken sopes you will ever have. So yummy! 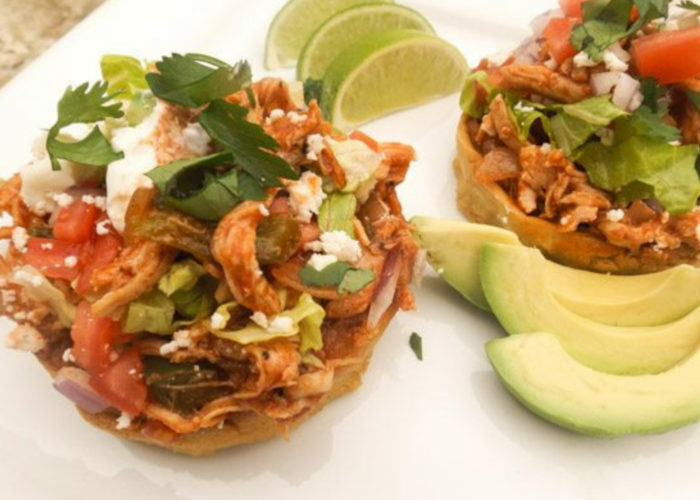 Chicken Sopes are just flat-out delicious! So these little guys go quite fast. And by the way they are not so little! These “Mexican corn cakes” are about the size of a fist. This recipe makes about a dozen of these deliciously topped corn cakes. It is said that sopes originated from the central and southern parts of Mexico. Although no one truly knows or can pinpoint their origins, all we really know is that they originated in Mexico. They are made out of very fine cornmeal or corn flour, “masa harina” or “masa de maíz.” They were originally also known as pillizcadas. 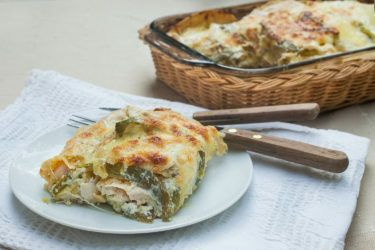 Their distinction from other similar antojitos (appetizers) is the pinched raised sides, forming a bowl, that holds all the scrumptious goodies. Sopes are considered a common staple in most households and are eaten as a snack or as a starter to a meal. They're also a very popular street food. 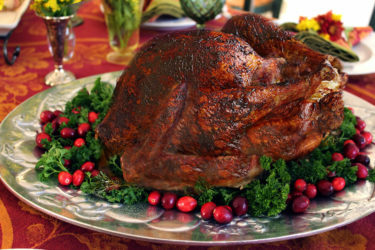 They can be made with practically any kind of filling, including chicken, beef, pork, turkey, and even seafood. Don’t be intimidated by this or any other sopes recipe. Sopes are not hard to make. Maybe some may look at this recipe and get a little concerned. Yes, ok, there are a few steps, but forming and making sopes is certainly not difficult. Once you have the dough made and fried, it’s one, two, three! And the outcome? Well worth it! 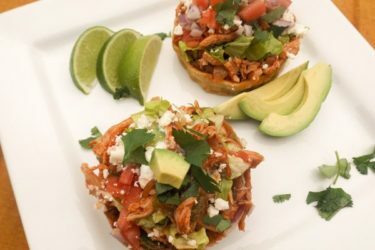 How Do You Prepare Pre-made Sopes? That’s the beauty about making sopes, you can make an extra batch of the masa recipe and form them and then freeze them for up to three months. Whenever you get in the mood for some chicken sopes, steak sopes, pork sopes or maybe some shrimp sopes, the masa will be ready to go! Just defrost them for a few minutes, fry them up and top them with whatever you like! Or you can pop them in the oven at 350 degrees Fahrenheit for 15 minutes. 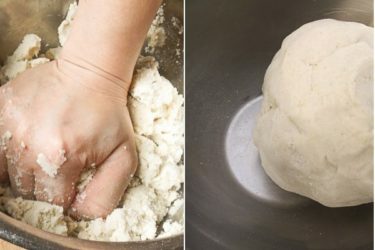 Mix the dough until you have formed a ball and the dough is not sticky. 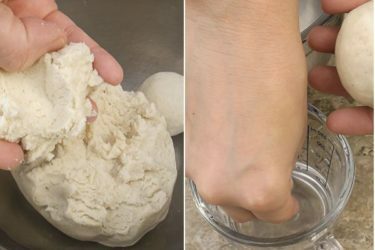 If the dough is too dry, add a little water at a time and continue kneading until smooth. This should only take about 3 minutes. Take some dough and form two- or three-inch balls. You may need to wet your fingers to make them smooth. 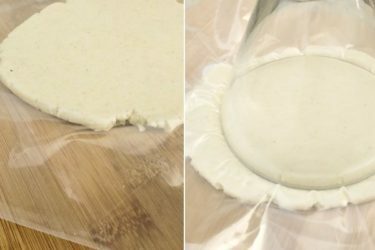 Place the individual balls into a large resealable bag, and use a rolling pin to roll into a circular disc. Roll them out to about 1/8 inch in thickness. Use a cup to press down on the disc. In a cast iron skillet or any similar pan, cook the sopes two at a time (no more! Sopes have to be hot to form that wall! Otherwise they will harden and you will not be able to work with them). Cook for about 3 to 5 seconds on each side and remove immediately to form the actual sope. Quickly work with your fingers to form a wall. Start from the the inside of the sope, spreading out toward the edge. The sopes must still be hot in other to do this step. Caution: they're quite hot but just move quickly. Fast, fast, fast!!! Rinse chicken breasts under cool running water. Place in a pot with enough water to cover and cook over medium heat for 20 minutes. Once done, remove chicken and let cool for a few minutes. Reserve about half a cup of broth the chicken was cooked in. 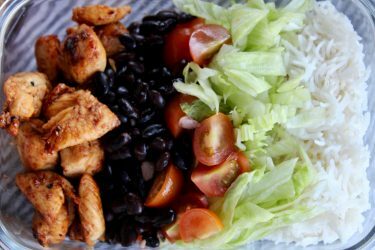 Shred chicken with two forks and set aside. Chop the onion, peppers, tomatoes, lettuce, cilantro and garlic. Dice the avocado into small cubes and sprinkle with some lime (this prevents the avocado from discoloring). Set all ingredients aside. Be careful not to rub your eyes after cutting the serrano pepper. Mix 2 cups of the MASECA Instant Masa Corn Flour with 1 1/4 cups of water in a bowl. With clean hands, mix the corn flour with water and knead until a uniform dough forms and is no longer sticky in you hands. If the dough is to dry, add in a little more water, and if the dough is too sticky, add more corn flour. 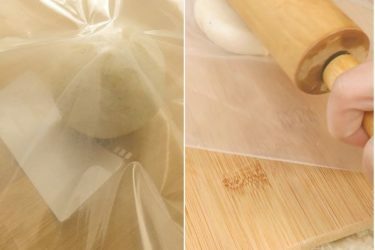 Form 2- to 3-inch balls of dough and place them one at a time in a resealable bag. 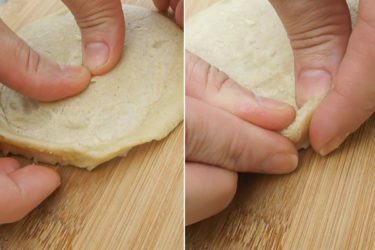 Flatten with a rolling pin and with the rim of a glass or biscuit cutter, press down to cleanly cut a disc (circle). Remove the discs from the resealable bag. Incorporate the dough scraps left in bag back into a bowl and form into more balls (whatever is left). Repeat the same process with the rest of the balls. Lay out your discs on a tray. 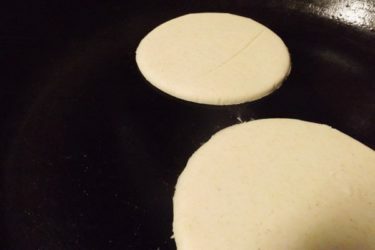 Cover with a damp paper towel to keep moist while you start to heat the discs and form the sopes. Add a teaspoon of oil to a cast iron pan and spread oil around pan with a napkin. Heat over medium heat for a few minutes until pan is quite hot. Add NO MORE than two sope dough circles at a time to pan and cook for about 3 to for 4 SECONDS on each side. Remove from heat and lay on a plate. 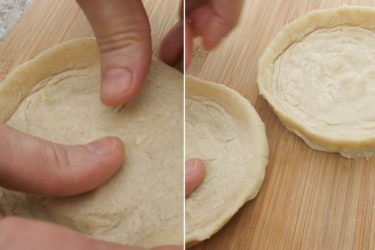 Immediately, using your fingers, spread dough from the center out to edge to form a wall, pinch along the sides. Be careful dough is hot. Repeat with second sope. You must work quickly to form walls or dough will harden...this is why we do two at a time. Set aside. Now go back and repeat the same exact process with the rest of the dough circles. Now you are ready to fry the sopes. In a frying pan or cast iron pan, add about an inch or a little more of vegetable oil. Heat oil over medium heat. Cook a few sopes at a time and fry on each side for a few minutes until golden brown and sides are a little crispy. Remove and drain on paper towels. Time to finish the chicken. In a pan, add about two tablespoons of oil and heat over medium heat for a minute. Add half the mixture of the red onion, all the bell pepper and serrano. Sauté for about 5 minutes and add garlic. Cook for 2 minutes. Now add the chicken and paprika, salt and pepper to taste and mix all together. Add the whole can of Goya sauce to the chicken and the 1/2 cup of reserved broth. Continue cooking for 10 minutes until broth evaporates. Warm the refried beans in the microwave for 1 minute or in a saucepan over low to medium heat for a few minutes. Add about 1 tablespoon of bean mixture to each sope bowl and spread. Now add chicken mixture to each. Mix the lettuce, tomato and remaining red onion together. Top each sope with salad mixture. Add a teaspoon of sour cream to each (optional.) Slice queso fresco and crumble with fingers. Add queso fresco to sopes. Add avocado cubes (optional). Finally sprinkle cilantro on each. Serve 1 to 2 chicken sopes per person with sauces. Enjoy! You can make a batch of sopes and freeze them up for up to three months! 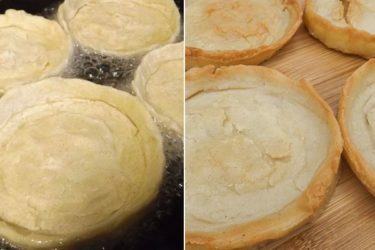 That way whenever you are in the mood to have these delicious sopes, you can just defrost them for a few minutes and fry them as you normally would or you can pop them in the oven at 350 degrees Fahrenheit for 15 minutes.